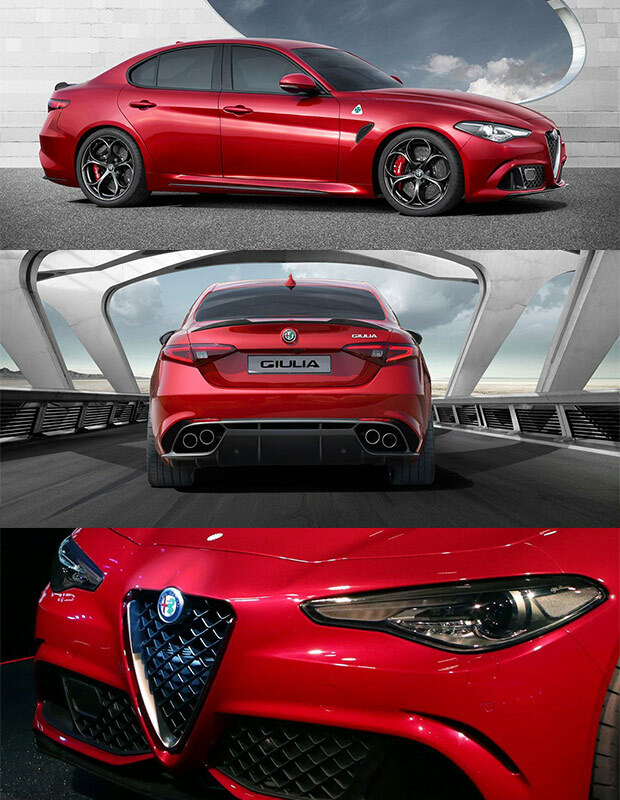 The launch of the Alfa Romeo Giulia blew up Twitter with imagery and energy around their bid to kickstart a new age of Alfa. The launch in Milan, sparked Alfa’s confidence within a sector that has been dominated by its German counterparts. Timed for its 105th birthday, Alfa accompanied the launch of the Giulia with their made-over iconic badge, marking a new chapter in Alfa’s ambitious goals. The Alfa Romeo Giulia’s sports version embodies more power than similar vehicles in its class as it uses a Ferrari-derived Maserati V6 that delivers 510hp from its twin-turbocharged 3L engine. The Giulia Quadrifoglio (Italian for ‘cloverleaf’) embodies the core elements that has made Alfa Romeo one of the world’s most iconic italian automotive brands. Encompassing unique and innovative mechanical and technological advances to gain an edge of other premium rivals. The newly revealed Giulia Quadrifoglio with rear-wheel drive and manual transmission, can deliver the same amount of power as some premium German variants, but offers it in a smaller engine that can deliver more power (nearly 85hp) than similar cars in it’s class. Lightweight design, such as carbon fiber hood and roof as well as composite design, help reduce weight to about 1,500kg, increasing performance abilities. The Giulia Quadrifoglio is also the fastest, in terms of acceleration, within its class. It goes from 0 - 100km/h in 3.9 seconds! Alfa Romeo has incorporated its new motto - la meccanica delle emozioni or in English, “The mechanics of emotion.” Lightweight, innovative double-clutch Torque Vectoring systems, instantaneous brake responsiveness and dynamic driver-selected behaviour, makes the Giulia a top competitor in a highly competitive market.